Sustainable Living Tucson: What's Up with the Proposed Rosemont Mine? 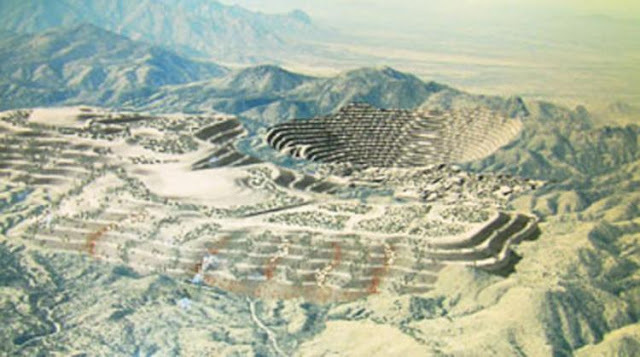 If you’ve been looking at the newspaper recently, you may have seen an op-ed from the Tucson Chamber of Commerce saying that it is time for us all to stop “fighting” and for the Rosemont mine to start. That was followed by a number of letters to the editor that clearly explained why the mine is a really bad deal for southern Arizona. 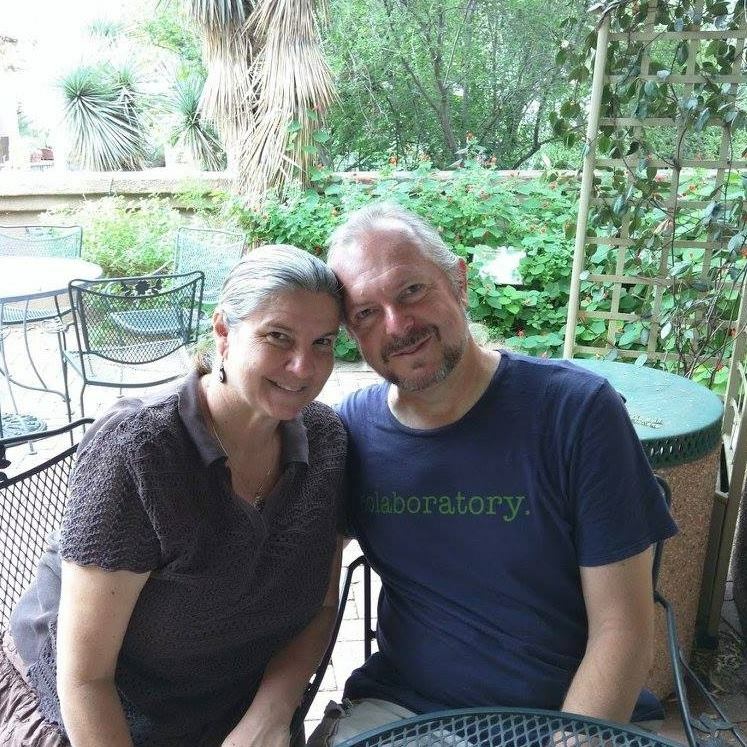 At Sustainable Tucson's October 9th meeting, Gayle Hartmann, president of Save the Scenic Santa Ritas, gave us an update on what is happening and what is likely to happen in the near future. It isn't a done deal. Several organizations including Save the Scenic Santa Ritas, the Sierra Club, the Center for Biological Diversity, the Tohono O'odham, Yaqui, and Hopi nations are suing the mine. They have an excellent case. 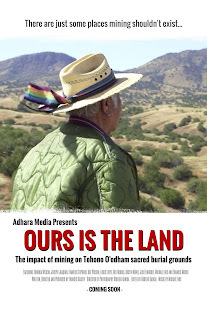 “Ours Is The Land” is a short film that depicts in moving and powerful detail the spiritual, cultural, and physical connection of the Tohono O’odham people of Arizona to Ce:wi Duag or the Santa Rita Mountains which are imperiled by the proposed creation of the mile-wide, half-mile deep Rosemont open pit copper mine. Desecrating this revered area with a mine would fundamentally alter the cultural landscape of the Tohono O’odham nation. The proposed mine will be built in one of the most biologically diverse regions of the country. Ecotourism is a big boom to our 23 billion dollar tourist industry. Birdwatchers come from around the world to enjoy it. If the mine goes through, tourists will get a clear view of the huge, gaping pit as they drive down scenic highway 83. The economic impact of the 400 jobs that the mine will create won't begin to equal even 1 % of what ecotourism brings to our state economy. The mine is expected to be in operation for 20 years, but the devastation to the region's diverse ecosystem and our water supply will last for hundreds of years. Impact on our water supply: The mine will be nearly 1 mile deep - below the level of the aquifer and the ranchers' wells. That same aquifer provides Tucson with 20% of our water. And the toxic tailings will end up in our water. When the mine stops running it will become a huge toxic lake. The Rosemont mine has been formed into a limited liability company - so they will leave it for tax payers to clean up. We have an antiquated law in Arizona that allows mines to use as much water as they want. All this during a drought that has drastically reduced the water level in Lake Mead where we get our CAP allotment. "For the greater community, including Tucson, Hudbay expects to remove up to 18,500 acre-feet of groundwater from the mine site before actual mining would begin. Based on an estimate of 108 gallons of water used per person per day, that’s enough water to serve the average person in Tucson for 56 million days! Remember, this is what must be pumped before Hudbay can even start mining. It does not include the long-term groundwater pumping needed from the wells near Sahuarita for the 20 years or more of mining operations. Nor does it include the loss of groundwater that will seep into, and then evaporate from, the mine pit, forming a toxic pit lake that will never be remediated. The Rosemont Mine would involve massive earthworks, thereby impounding mine runoff in new places where water will seep into the ground. With Tucson downstream of the mine, is the Corps really confident that impounding water in the toxic pit lake and runoff on top of fractured rock will not lead to pollution of our community’s aquifers? There is no plan and no money for addressing dam breaks and pollution of streams that feed the Tucson water supply." The documentary "Cyanide Beach" tells how the directors of the Rosemont mine were also on the board of Augusta. They promised the people of Sardinia, Italy that they would clean up the poisonous tailings left from their open pit gold mine, but instead they left a toxic lake that threatens the town's water supply. We have got to stop this mine! In the following blog I tell about two other bills that I proposed to Rep. Kirkpatrick that could help prevent mining companies from savaging our public lands. In the letter, Grijalva and Kirkpatrick, both Democrats, requested the Corps provide the Natural Resources Committee extensive documentation about the decision-making process being used by the Corps in determining whether to issue a Section 404 Clean Water Act permit for the mine. They also requested a meeting with the Corps prior to it publicly announcing its permitting decision. UPDATE: Congresswoman Kirkpatrick and Congressman Grijalva have joined forces to take the Army Corps to task for their decision. Raul chairs the Natural Resources Committee and Ann sits on the Appropriations sub-committee that determines the Army Corps appropriation. They have some leverage in those roles. This is a numbers game. We need to have a mass public uprising against the mine! So please, share! We're fighting for the future of Tucson here! Please join Sierra Club and other members of the Save the Scenic Santa Ritas coalition, in making a statement that we will not stand idly by while our environment is under assault from foreign mining companies. Speakers will include our congressional representatives as well as local elected officials and representatives of Indigenous communities. 300 West Congress St., Tucson. U.S. Reps. Raul Grijalva and Ron Barber wrote a letter to U.S. Agriculture Secretary Tom Viilsack, who oversees the Forest Service.